There are a host of 3D printers out there, but none are as simple and inexpensive as the Printrbot created by Brook Drumm. It’s still in Kickstarter mode, but as of this writing,( the Printbot has already met the pledge goal. So we’re going to be seeing some of these in the future, and I know I already want to get my hands on one. There are a lot of different Printrbot kits you can order right now by pledging funds to the project: Some kits have only the basic parts, and no electronics, while some are even sparser, not even containing motors and hardware. I suppose if you got a bunch of hardware lying around and want to buy the electronics yourself that’s a good way to go, but Brook will offer a kit for $499 that includes everything you'll need to build it. For somebody looking to get going right away that’s probably your best bet, and it’s a lot cheaper than a MakerBot--and you can be printing in under 2 hours. The coolest part about the Printrbot is that, once you get it built, you can use it to make expansions to the bot. That's right--the Printrbot prints its own upgrades. 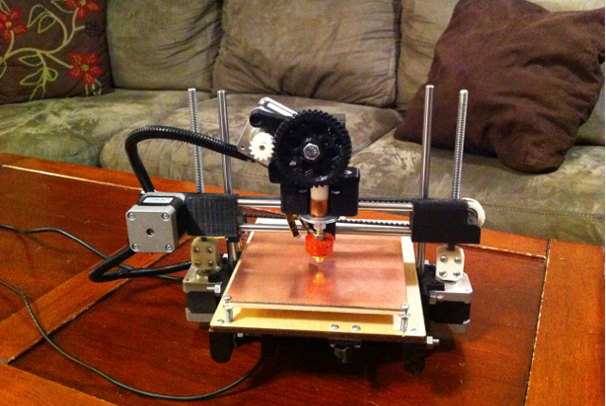 You can expand it and even print the necessary parts for a friend, so they too can build a 3D printer. What’s the first thing you would print with one of these? Leave a comment and it will be fun times.